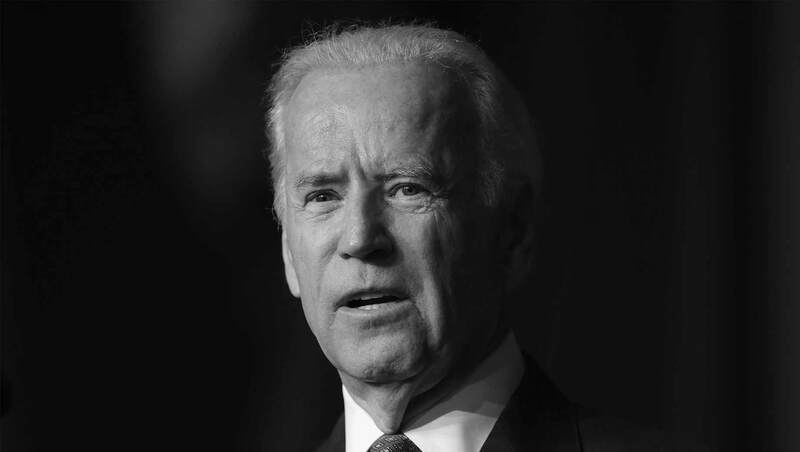 WASHINGTON, D.C. -- As many Democratic Party supporters and power brokers wait to see whether former Vice President Joe Biden will enter the 2020 presidential race, recent Gallup polling indicates that he would be a formidable candidate, given Americans' positive image of him. 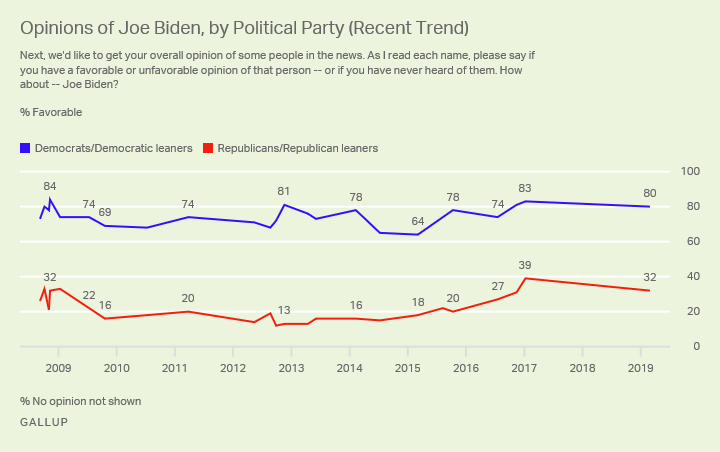 Currently, 56% of Americans have a favorable opinion about Biden. Although that is down slightly from the prior reading in January 2017 near the end of his vice presidency, it still ranks among the best Gallup has measured for him to date. The latest results are based on a Feb. 12-28 Gallup poll. Biden is expected to announce his intentions soon, and his high profile and overall popularity would arguably make him the presumptive front-runner. Biden was also popular as a vice presidential candidate in 2008, although his ratings declined while he was vice president in President Barack Obama's administration. From late 2009 through early 2015, when Obama's job approval ratings were generally in the 40% range, Americans were about evenly divided in their views of Biden. This is similar to the pattern that has occurred for incumbent Vice President Mike Pence, who currently has a 42% favorable and 42% unfavorable rating. Near the end of Obama's presidency, Biden's popularity increased, peaking at 61% during his final days in office. Biden has retained most of that increase over the past two years. Eight in 10 Democrats and Democratic-leaning independents have a favorable opinion of Biden. As would be expected, Republicans and Republican leaners are much less positive toward him, although nearly one in three do view him favorably. By comparison, President Donald Trump has a 44% favorable and 56% unfavorable rating among all U.S. adults. Among Republicans and Republican leaners, his favorable rating is 87%, while it is 7% among Democrats and Democratic leaners. Biden's image is similar to that of another leading contender for the Democratic nomination, Vermont Sen. Bernie Sanders, who officially announced his candidacy on Feb. 16. Gallup last measured opinions about Sanders in September, at which time 53% of U.S. adults had a favorable opinion of him and 38% an unfavorable one. Sanders' image has been consistently positive since his campaign for the 2016 Democratic nomination ended. In addition to Biden, the Feb. 12-28 Gallup poll included ratings on five Democratic U.S. senators who announced their intention run for president or set up exploratory committees to consider the possibility. These include Elizabeth Warren, Kamala Harris, Cory Booker, Amy Klobuchar and Kirsten Gillibrand. All five of these senators are rated similarly in that their unfavorable rating exceeds their favorable rating by between two and eight percentage points. There is variation in how well-known they are, with about twice as many unfamiliar with Klobuchar and Gillibrand as with Warren. 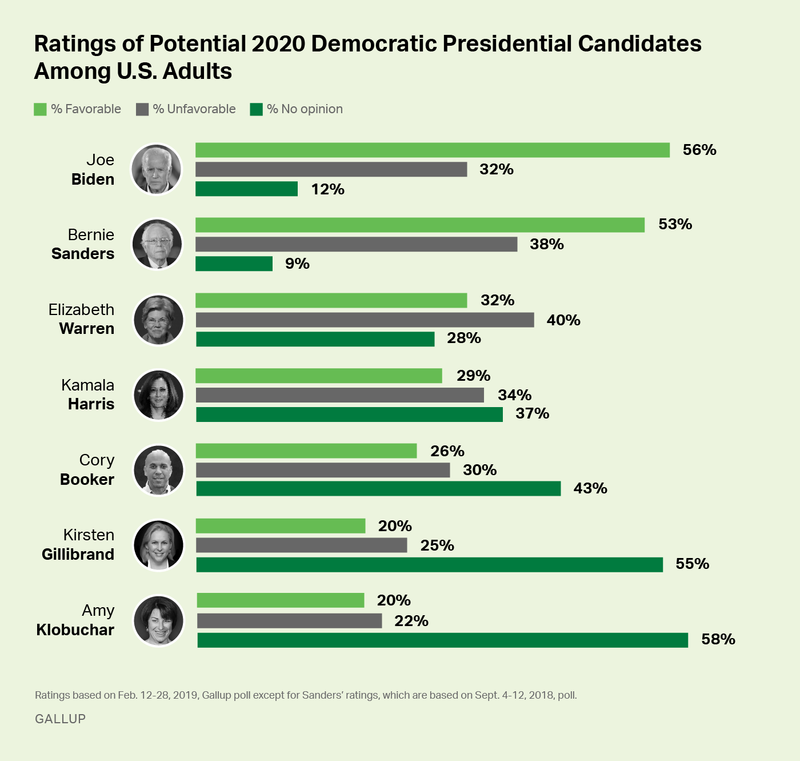 This is the first time Gallup has asked about Harris, Booker, Klobuchar and Gillibrand. Opinions of Warren have become more negative compared with Gallup's prior reading on her in August 2017. Since then, her favorable rating has held fairly steady at 32% (compared with 34%), but her unfavorable rating has increased nine points to 40%. Warren's claims of Native American ancestry have been a source of controversy for her. Shortly before the poll began, The Washington Post released a story showing that she listed her race as "American Indian" when she applied to the Texas bar in 1986. 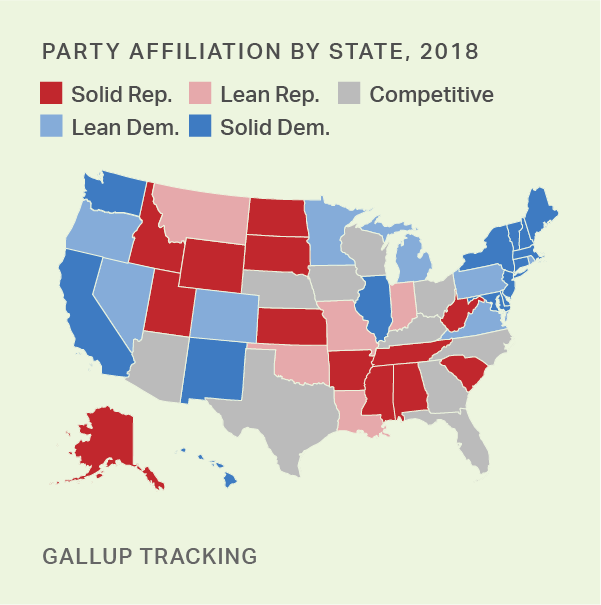 As would be expected, Democratic identifiers and leaners generally view each of the potential Democratic contenders much more positively than negatively. All have favorable-to-unfavorable ratios of roughly 3-to-1 or better among Democrats and Democratic-leaning independents. The major differentiator in opinions of these candidates among the Democratic base is the extent to which they are known, because none are viewed very negatively. Unfavorable ratings of these candidates are mostly around 10%, though Sanders (15%) and Warren (18%) have slightly higher scores. 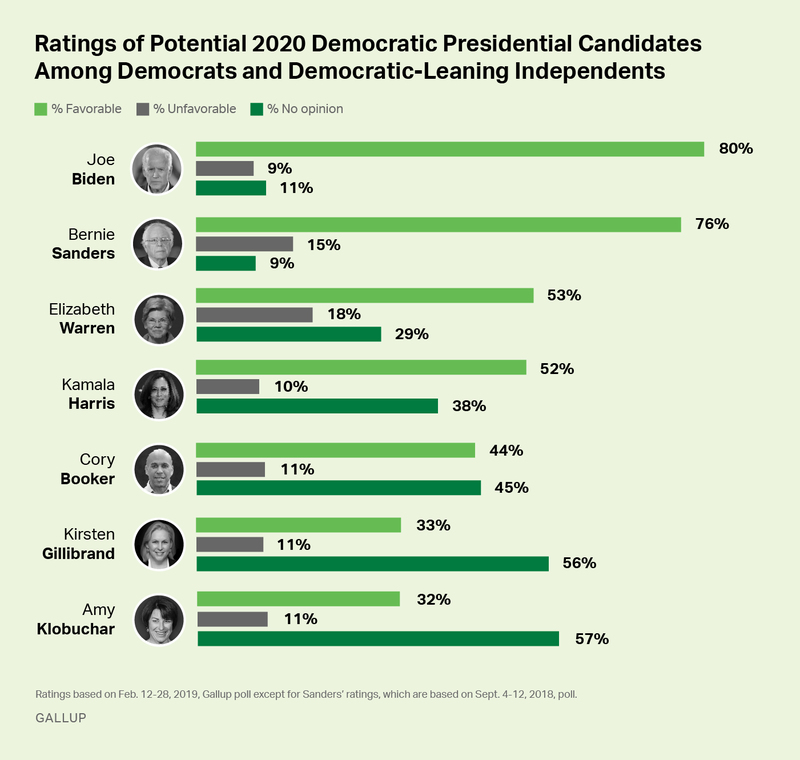 As such, the best-known Biden (80%) and Sanders (76%) have the highest favorable ratings among Democrats, while the lesser-known Gillibrand and Klobuchar have favorable ratings in the low 30s. A slim majority of Democrats view Warren (53%) and Harris (52%) positively, while 44% have a positive opinion of Booker. Democrats' current opinions of Warren are less positive than they were in August 2017, with her favorable rating down five points and her unfavorable rating up by six points. At this early stage in the 2020 presidential election cycle, Trump appears to be vulnerable, given his sub-50% job approval ratings and his weak favorable ratings. Democrats would enhance their chances of winning by nominating someone who is well-liked by the American public, something neither they nor the Republicans did in 2016. Typically, the candidate with the higher favorable rating wins, with 2016 being the only recent exception. At this point, Biden and Sanders are the most well-liked, perhaps because of their higher profiles given their long government service and past presidential campaigns. However, that does not necessarily mean they will be the best candidates in the 2020 general election. Hillary Clinton was in a similar position in early 2015, before news came to light of her use of a private computer server installed at her home to conduct government business. As occurred with Clinton and most candidates in past elections, Americans' favorable ratings of the candidates are likely to change in response to news during the campaign about the candidates and their pasts, and how well they do in debates and in the primary elections. Most of the lesser-known candidates should become more familiar to Americans, and can hope to become better-liked in the process. It is nearly certain that Democratic Party supporters will mostly grow to love their party's eventual nominee (and Republicans likely will grow to dislike him or her), so a key will be how well the Democratic nominee appeals to independent voters and Republicans who are unhappy with Trump. But even within the Democratic Party, a candidate with favorable ratings in excess of 90% could engender greater enthusiasm among Democrats and translate into higher turnout for their candidate.